First of all THANK YOU for all your caring, concerned messages PBers! It means a lot. But Louise wrote she was outraged I showed a stuffed bear when Paris was up in flames! I had to stop and think a bit...and look up 'Alter Ego'. An intimate and trusted friend. Bear is all of those. You may not know Bear. 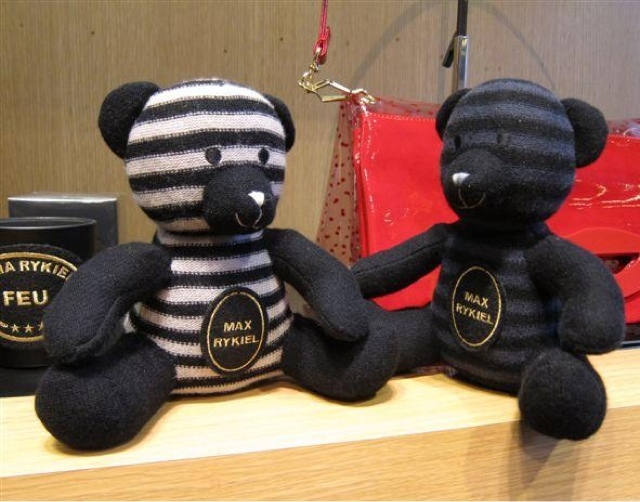 He was gifted to me in March, 2010 by Lola of Sonia Rykiel. We haven't been apart since. Six years of traveling to and fro to France, and always the best companion. We have a lot in common. We both would rather browse menus than eat inside. 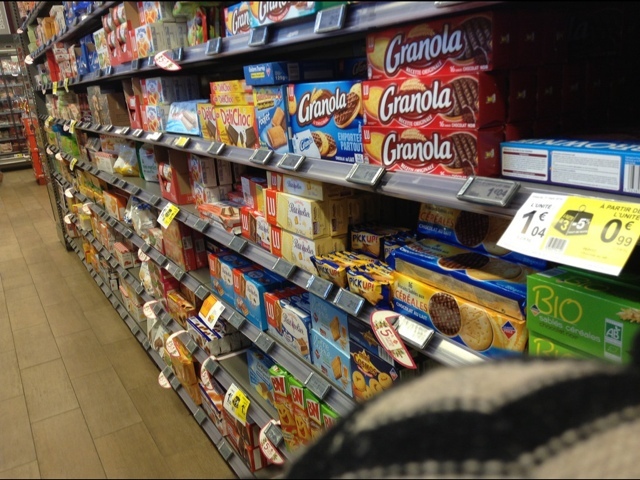 Browsing cookie aisles is another shared pastime. 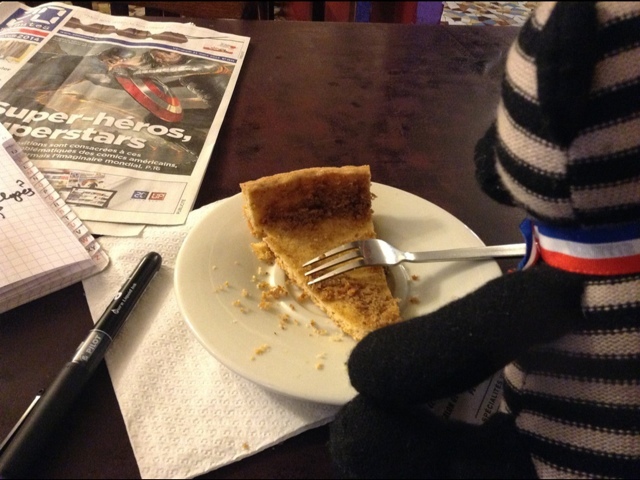 Bear doesn't eat pie/tarte crust either. Bear is a working partner by the way. He earns his keep on Etsy. In charge of product fulfillment and he makes sure every envelope has a stamp. Last week Bear and I researched the November Sketch letter. 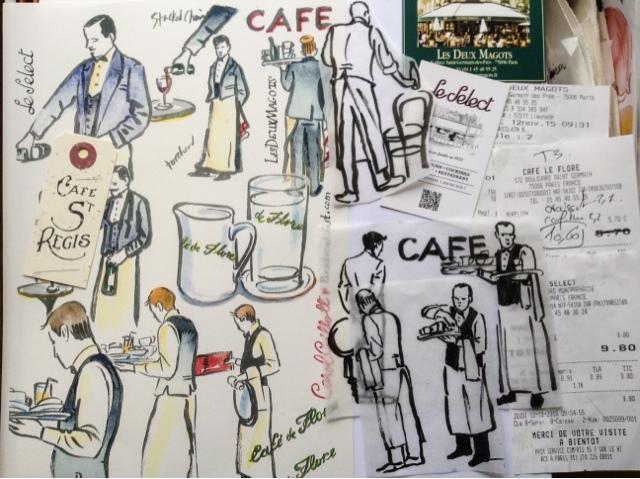 I wanted to draw classic Parisian café waiters. That entailed eating a lot of classic petit dejeuners last week. I can tell you the best deal is at Cafe Le Select. 9,80 for 'Sur le pouce'. Excellent hot chocolate + freshly pressed OJ + the crispiest croissant. 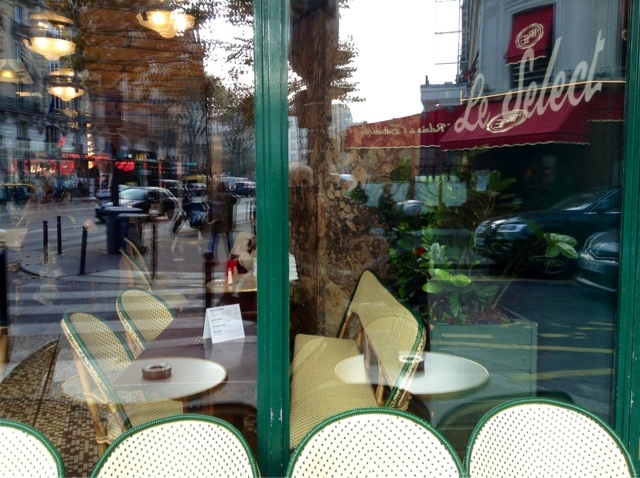 If you love Paris cafes you'll be very happy reading Le Select Crowd. Filled with Rick Tulka's daily drawings and text by Noel Riley Fitch, Perfection. For the best apricot jam on the planet, Le Deux Magots is tops. Their signature goodies downstairs are wonderful by the way. 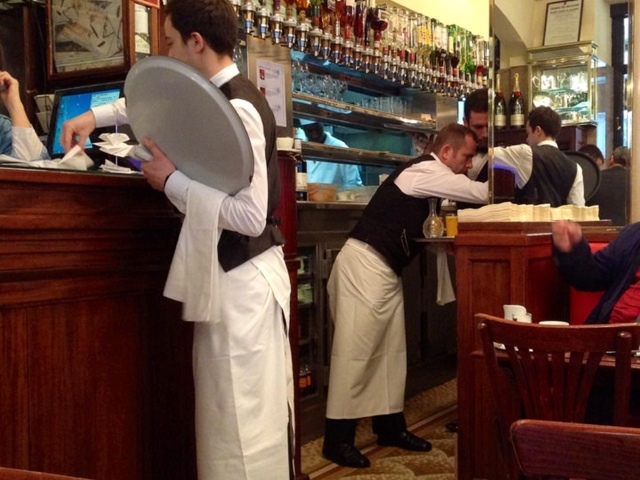 Go to Cafe Flore, even though their croissants are kind of mushy the waiters are top drawer. Living on Isle Saint Louis, you are removed from the rest of Paris. And my TV doesn't work. I've been dependent on the NYTimes and other news sources. But there is no getting away from the constant sounds of sirens. In New York during 9/11 there was no escaping the disaster. The air was full of smoke and I saw the WTT go down from my rooftop. Sometimes being in the midst of a tragedy it's harder to fathom than those watching it from afar. I do know I don't want to leave Paris. And I'm lucky to have Bear around. Elaine Sciolino is in New York right now. Thanks Andy and Diane for sending her talk on fresh Air on What it means to be French. 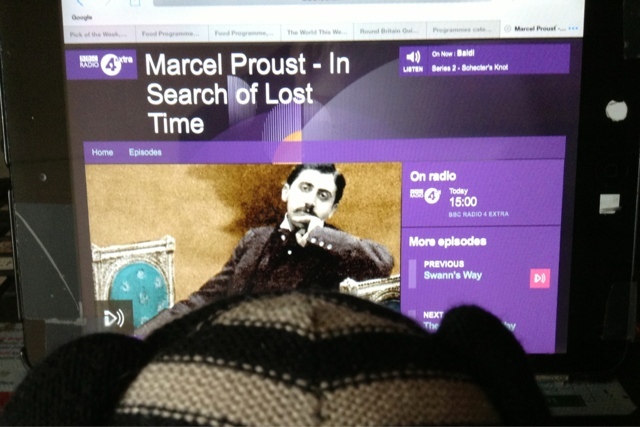 Another diversion - the BBC's excellent daily 1 hour dramatization of Proust's In Search Of Lost Time. 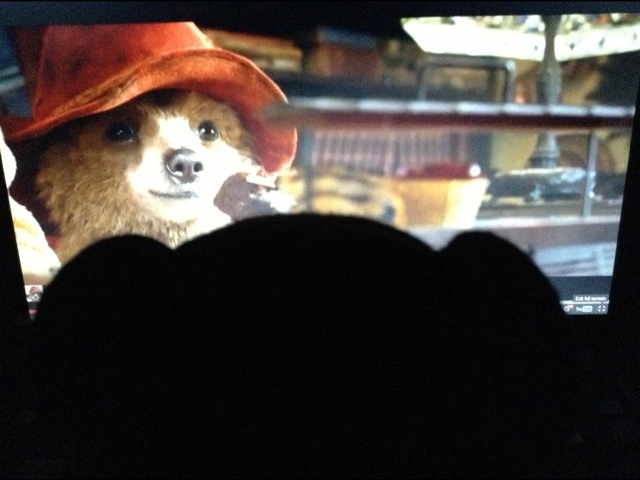 Bear is listening even though its in English. Who is Louise and why is she outraged? I saw Bear and got it at once. He is a comfort & priceless. Be glad your TV was not working, Carol. Some of the videos were dreadful, especially the man from Le Monde whose apartment looks over the alley behind the Bataclan. I cannot watch it ever again nor do I want to. So, so sad. But Paris will always be Paris and always beautiful so ...life goes on. me too: "I saw Bear and got it at once." Carole, I'm sorry you felt you had to apologize. The vast majority of us understood exactly. Bear is a quantum more than a stuffed animal (as if that would not be enough). I too "saw Bear and got it at once." I'm particularly glad you two were together this last week. hi Carol....I was there in Sept and would get on a plane tommorrow...meme pas peur! take care, love Le Select...that's my hood. I agree with Maureen It instantly made me feel better. I knew you were OK when you said Bear was. Although, I have a compagnon de pelerinage as well, so I would. My heart goes out to you all, and as soon as I can find an excuse, I will come to Paris, sit in a cafe and have a croissant. There are still more wonderful people in the world than there are the other kind. It made me feel better to know the you AND bear were ok. Bear brings comfort to many of us! It's so very easy to find fault in others...I prefer to admire your strengths! I am ashamed to admit that Bear's welfare never crossed my mind when I checked in with you...what was I thinking? So very glad that you and Bear are fine, and trust you both to carry on! 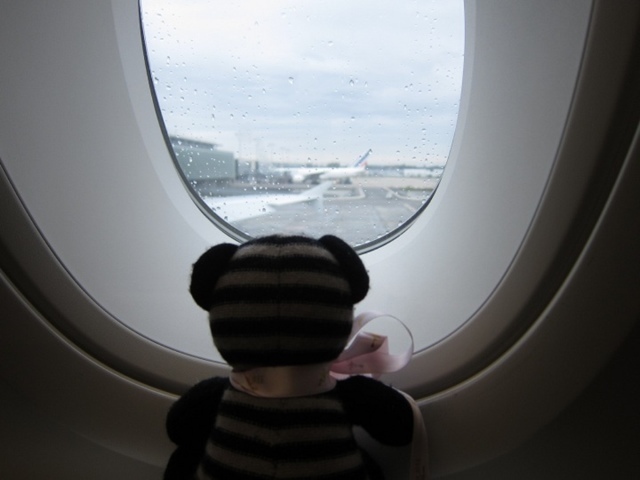 I have followed PB since you were living in NY and making all those transatlantic flights. Bear has been with you a long time and I am sure has been a wonderful companion to “talk” to when life decisions needed sorting out. I am glad you have him and your post after the awful Paris attacks without him would have been empty. Godspeed and I am so happy you are safe and well. And besides, among other things, the attackers were attacking your right to take your bear to tea, whenever and wherever you would like. You and bear keep safe. My mother always said:"If you have nothing nice to say..don't say anything at all.."
My credo..Once in a very blue moon..I will..something overcomes me..
"Louise..was that really necessary? We're searching for peace..not confrontation". Bear..such a cute sweet bear.Block your ears darling. You'll never please everyone! I love, love, love Bear. Please know that for every naysayer, there is probably 2 or 3 who love Bear. I enjoy your posts so much. Thanks for all the effort you put into them. People who complain often have all sorts of problems! When you were still in NY, I thought Bear might be a dog! He seems a most pleasant companion. No matter what it means to you, Bear is a stuffed toy, and your post showing it to be okay when the rest of Paris is reeling was insensitive and crass. Nancy, whoever you are, please go elsewhere. You try to accuse Carol of insensitivity while you display it here yourself! Perhaps you might consider removing your callous reply here? Nancy, you need to take your vitriol away from this lovely page. We need no lessons on processing the Paris tragedy from you. What is insensitive and crass is your post. Shame on you. Nancy..... you are new here?? Know nothing of Carol's wit? Bear is metaphor for comfort. Perhaps you need a bear of your own? I loved Carol's post and understood it fully. I love all of Carol's posts. Nancy, I'm willing to bet that you're a perpetually offended American so, whatever you do, don't look at the current cover of Charlie Hebdo - on second thought - please do! Carol really doesn't have to explain anything to you. Bear is a familiar comfort to a lot of us who follow her and Paris Breakfast. Nancy, would you remove any bears left by the people in honor of the people brutally killed, and wounded, at the various Paris sites? When I saw the bear, I thought, "Oh, comfort, something sweet to hug during this time. There is hope for healing." 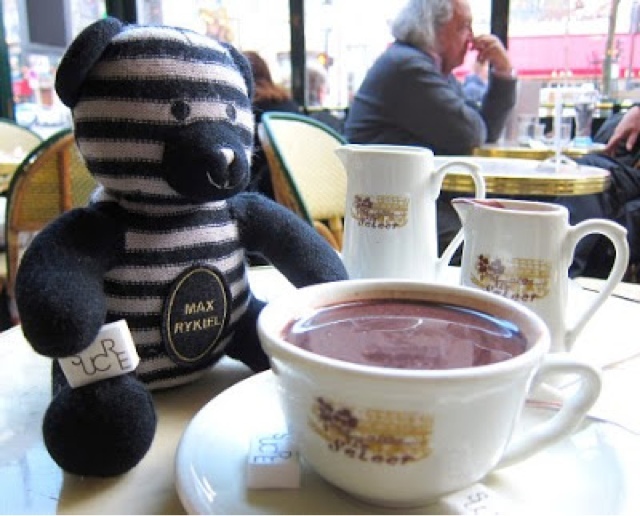 I didn't know the significance of the striped bear until now, but have read Carol's blog, and felt her tender heart as she uncovers Paris. My grandfather was 'un parisien', and who knows if any of my distant relatives were affected by this tragedy. No words, just asking God to "fix it." Carry, on Carol, you and trusty Bear. I think you nailed it firmly when you said "Nancy, would you remove any bears left by the people in honor of the people brutally killed..."
I can just imagine this insensitive woman walking up to these tragic sights with a empty trash bag and stuffing it full of all the "insensitive" stuffed animals, candles, flowers and cards that people leave in order to facilitate their grieving. She must work for the sanitation department somewhere and threw her own humanity out the first day or so. Nancy, there it a little "x" up in the corner of your computer screen. I suggest you use it if you don't like what you see here. In other news, don't feed the trolls. Nancy, that was downright insensitive and beyond rude. Carol deserves an apology from you. Carol, I knew what you meant by posting the photo of your Bear. I know that you are heart sick, especially so since you went through this in NYC (as did I) In the face of mind blowing tragedy we attempt to carry on as best we can. It's wonderful to have someone to talk to you who doesn't talk back sometime. Take care Carol. Love the post and Bear. Carol, please add me to the positive side of the comments ledger. Featuring Bear was fully understandable, perfectly fine and totally human. 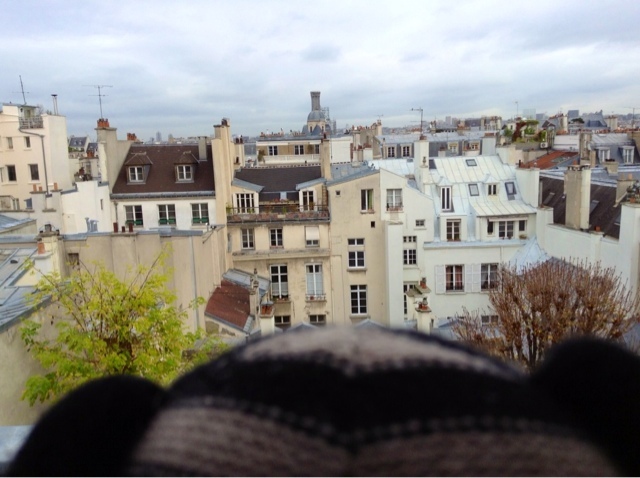 I was so happy to see dear Bear perched safely against your plump Parisian pillows and with his little suitcase bearing the Tri-Color. It was important to know you were safe and comforted by Bear. 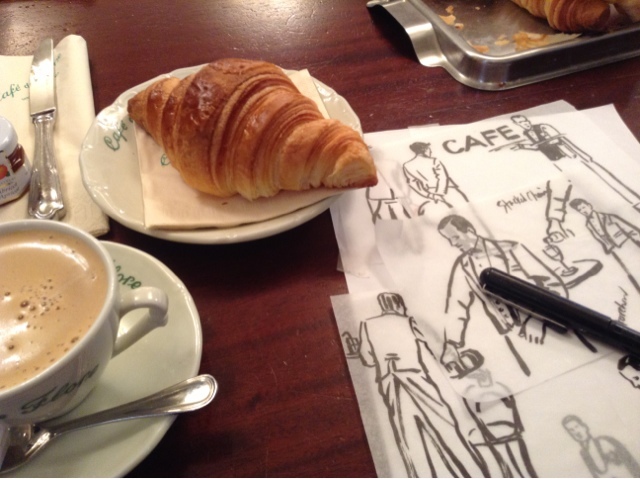 He is, indeed, as much a symbol of your Paris Breakfasts as any of your lovely sketches. It's also good to know that Bear is responsible for getting my Paris Notes to me every month too (and right on time, so thank you Bear!). We are what we love and loving a little cuddle-bug like Bear is through thick and thin, good moments and bad. And yes, "Nous sommes Paris" and send love and concern for peace from across the world!! Will wonders never cease? Carol, just delete those commenters that say such dumb things. Really, why would they even comment such things? MYOB naysayers. Find someone else to pick on, like the terrorists. From a different Nancy, you and Bear have been having a love affair with Paris that makes all of us, real or stuffed, or really stuffed, jealous. Your posts put us with you both in the restaurants, on the streets, in the stores, and with the people of Paris. Thank you both for sharing this part of your life. Bonjour encore, mon cher bear. How I've missed your small striped self. I can't believe it's more than five years that you first made your appearance here. 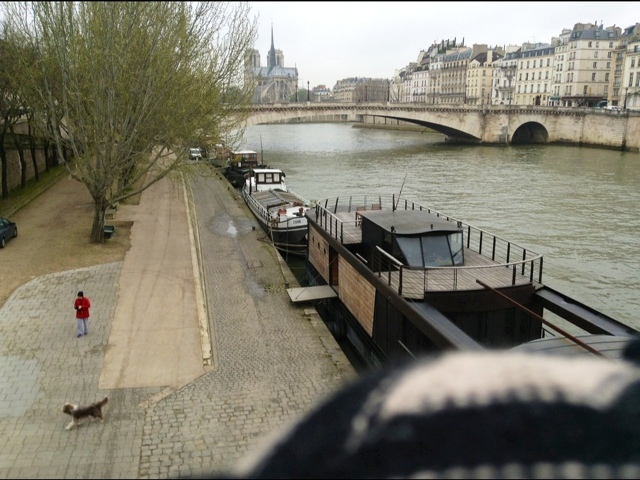 While you are looking at the rooftops of Paris -- so divine, how do you not keel over? -- I thought you might like to read about a wonderful thing your ancestors did. You can find it here http://www.lightspeedmagazine.com/fiction/bears-discover-fire/ Please also tell Carol that her photographs are more beautiful than ever -- what clarity, what framing, what light! Oh Parisian light -- you're making us crave it. Dear Carol, how fortunate I am to have had the pleasure of having tea with you and Bear. I thought that your photo of that sweet traveler was quite touching. Like you, I still have strong memories of being in NY on 9/11. Like you, I also continue to enjoy living in a city that gives such wondrous possibilities. Bear needs NO explanation! You expressed your relationship beautifully by the way. Lovely and interesting post. Your heart is revealed and ours are with you. Many here, Carol, have so eloquently and authentically shared what you, bear and parisbreakfasts means to them. 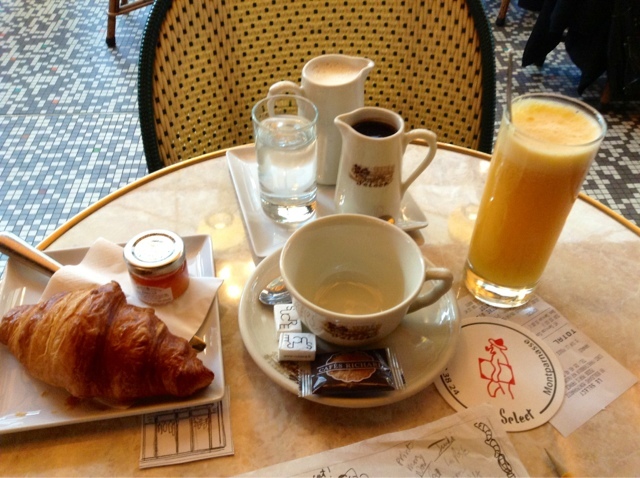 Those of us here who love getting a daily glimpse into your life in Paris value you, and all that you do here at parisbreakfasts. As so many have said, I knew you were okay as soon as I saw Bear! And I appreciated a bit of "lightheartedness" in the midst of all the horror. I get it, even if Louise doesn't! Vive Carol! Vive Bear! Vive la France! Hard moments for the whole world the point is that in same places is every day a war but we are too busy at our business to understand it or to pay attention outside our interests ,so only when something wrong happen to us we just open the eyes . Pay no attention to the grouches. My friend's bear helped me clear out my aunt's apartment a couple of years ago -- we couldn't have done it without Bongo. Now, don't you think it's time for a visit to A l'Etoile d'Or? Denise just reopened two weeks ago and yesterday she was in fine form! Chocolate is important in times like this, even if others would have you glued to the tube (which you can't access) or sitting and wringing your hands. Its top of my list! Thanks for the reminder Chanterelle. I hope the recent horror in Paris has not resurfaced any PTSD from your experience of 911 in New York. Best wishes for you and your little companion. Vive la France et Paris! I just returned from Paris on Monday before the horrific events on that awful Friday. If "bear" is a comfort and distraction - you should enjoy that moment. I posted some of my images and reflections from recent tour in central Europe and my finale in Paris. I hope everyone enjoys Paris as much as I do and may these images provide a moment of joy! I am in love with your sense of Living and pulling Bear into your life. I talk to my dog and take her everywhere. She is part of me and brings a steadfastness I need. I get it and was not offended. 1+1 = 1 sometimes. I LOVE SEEING BEAR IN ALL YOUR POSTS! I THINK MOST OF US GOT IT ABOUT WHO BEAR REPRESENTS! PLEASE CONTINUE TO INCLUDE BEAR, WE NEED HIM/HER MORE THAN EVER NOW! My bears and I completely understand!! Intrepid travelers, lovers of all things Parisian and French - and there when we need a little soothing support! Sorry you had to explain bear to a reader. Bad Piggy has been with me since 1984, is my pal and sometimes infuriating pal. Frowny Bear, more reserved and dignified, is also part of my life. Both have travelled extensively with me, often popping their heads out of the carry on bag to look around an airport. There is much in life to be enjoyed, celebrated, endured, wept over. Stay well....and a hug to Bear too. It was fun getting reacquainted with his past history in fact! Does Bear only speak French? 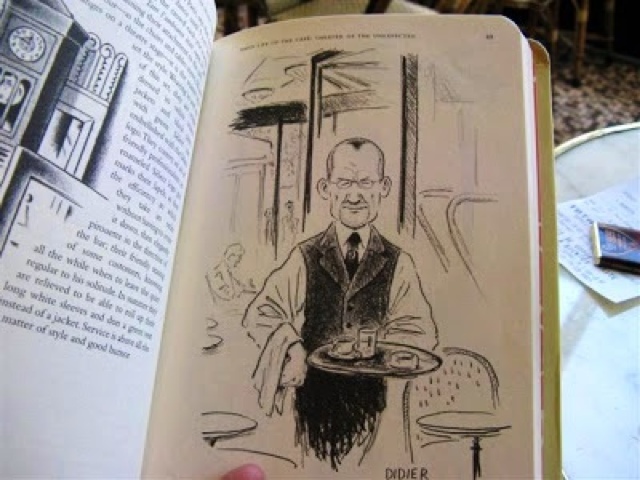 I always wondered what you look like and was never sure you were in your Paris Breakfast blogs...but saw the little circle with you (and Bear) on Etsy. I'm glad you looked up 'alter ego' rather than being wounded by the unkind words. Keep on enjoying your life! I love Bear! I just have a real bear (Australian Shepherd) at home that provides me the same comfort. And I have a stuffed monkey on the bed! Plus I love French waiters! Looking forward to my mail. I agree! You are SO lucky to live in the most beautiful city in the world! I love your posts and illustrations. Bless you and Bear! When I saw Bear in your November 14 post, my first thought was...Bear...Of course. I literally sighed with relief and sympathy. As Maureen said first and best: I got it. I'm so glad you and your little friend are okay. I knew immediately the message of your image. You and Bear were safe. Many of us had written and asked of your safety as we have done with other friends who live in Paris. 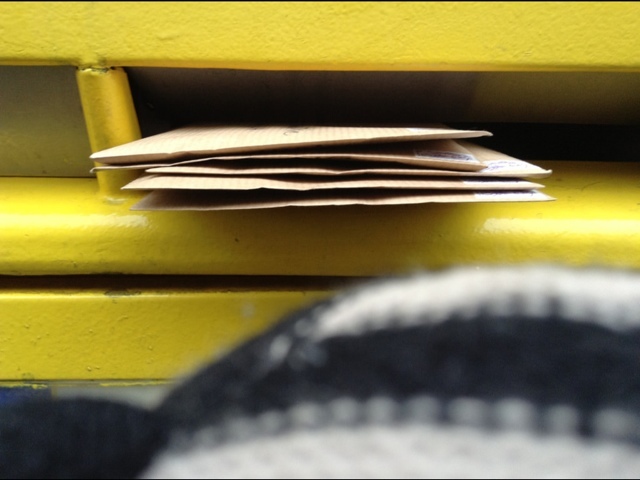 I was relieved to see the post. No words were needed. There are no words that can quantify the horror of that event. Paris is and always will be a part of me. That you take the time and share your talent to bring a bit of Paris to me with your posts is something I don't take for granted. 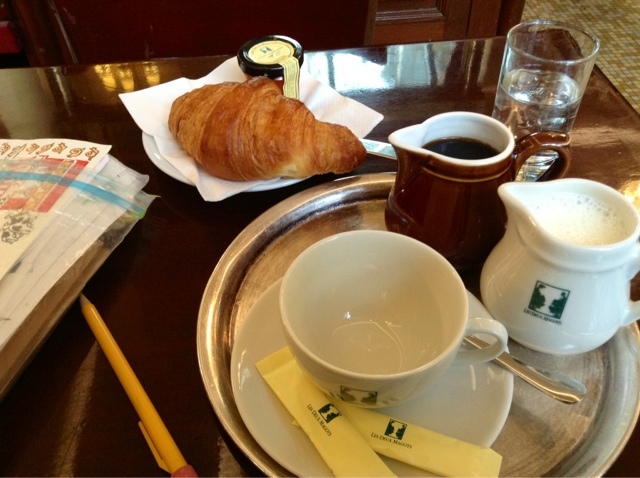 I appreciate Paris Breakfasts more than I could ever express in words. Thank you for sharing and for the love we all share for Paris. I look forward to your newsletters and am very happy when In see thelm in my mail box! 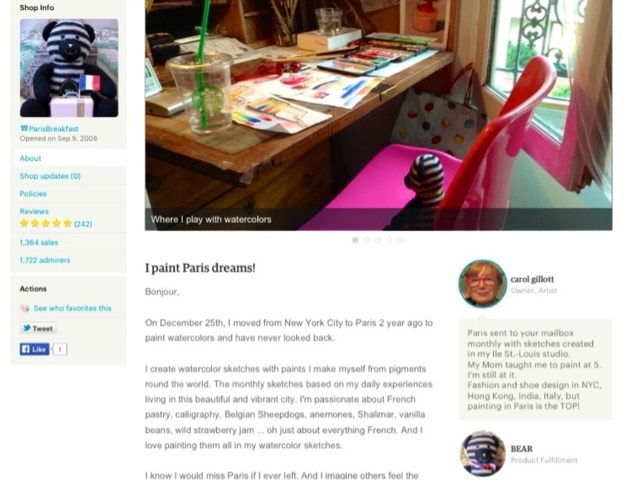 thank you so much for sharing a bit of your Paris-life! Keep going and stay safe! 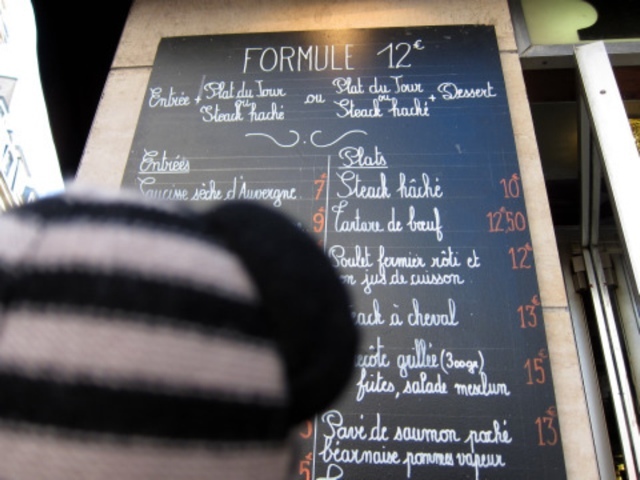 We are in Paris right now, staying in our usual apartment on Ile Saint Louis. I read your blog regularly, but didn't realize until today that you are on the Ile, too. I agree, it does feel separate from the rest of Paris. We feel safe here in spite of the heartbreakingly tragic events around us. 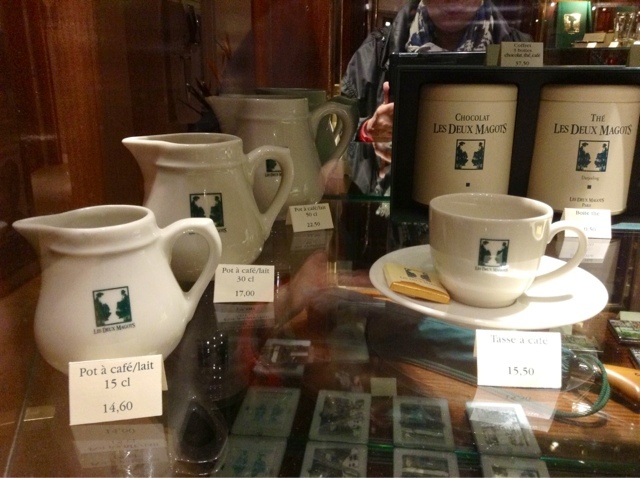 Also, I couldn't resist buying one of the little Le Deux Magots creamers several years ago. I use it every day when I'm at home in Washington, DC. We love Paris and will continue coming here for as long as we can. I was so happy to hear from each of my French friends. I immediately knew if Bear was okay, so were you. I will pray for Louise, clearly she needs it. My thoughts are with you and hope someone finds a way to resolve these destructive actions. I do not know who "Louise"is but she is obviously hurting and taking it out on the wrong ones. A quote came to me about not giving into fear but to " think on good things" and your lovely blog is certainly been a respite for me and allows me to start my day thinking on good things and I have been a PB follower for many years now. Here is the quote that came as a response to Louise.....Philippians 4:8 “Finally, brethren, whatsoever things are true, whatsoever things are honest, whatsoever things are just, whatsoever things are pure, whatsoever things are lovely, whatsoever things are of good report; if there be any virtue, and if there be any praise, think on these things.” Thank you for your beautiful blog and may God watch over you in the city of Light. I love your blog!!!!! Mary in Sedona, AZ, usa. I look forward to each and every one of your posts. I always ask about Bear :) He was a nice addition to the blog and now is a fixture that, I am very fond of. 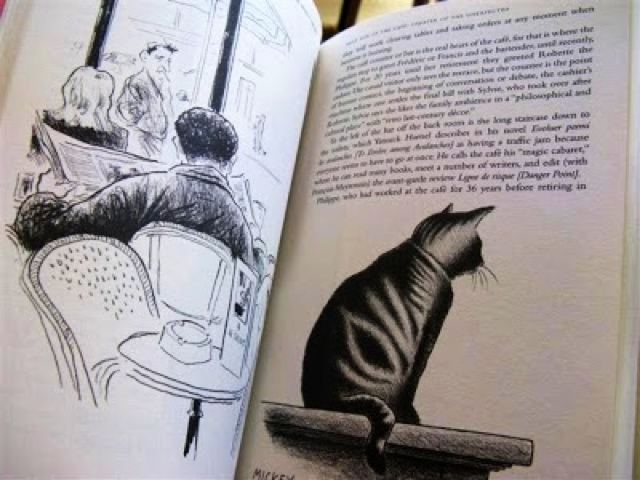 Hemingway hung around The Select and mentions it in "A Moveable Feast" and Rick Tulka's sketches are terrific. Take care of yourself & Bear, Carol. Carol, when I saw Bear's photo I was so relieved because I knew you were safe. Bear is as much a part of you as PB is and Bear is a symbol for all that is loving, full of adventure, cheer and joy. To see this symbol during a time of pain brings a sense comfort -- and we all need that right now. To show a photo of Bear is not to trivialize anything about these tragic events but to simply remind us you are safe and you have something, a very special alter-ego friend, for comfort. We all need our own version of Bear right now. As for Louise and some of the other commenters here, let me say with a degree of paraprofessional experience as a grief facilitator, that grief is experienced and expressed in an abundance of ways. In the case of blogging, not every post will be a beautiful photo of the Eiffel Tower or eloquent poem or biblical verse. How we express ourselves in grief is intensely personal and should not be criticized but honored. Please keep safe, my friend. And thanks for sharing Bear's back story, of which I was unaware! Looking forward to my next sketch! As others have stated, I was VERY relieved to see Bear's photo in my email. I knew that you were also safe. I live in AZ and love seeing Paris through your eyes and Bear's experiences during your travels/forays. Your insights are a breath of fresh air to this desert dweller! We all need an Alter Ego like Bear. Here's to your continued well-being: you, Bear, our beloved Paris and all the inhabitants of the world. Sometimes it feels like the world is broken beyond repair, but I truly believe it's in our power, collectively, to repair it and heal. Perhaps showing Bear was safe was like a sweet shorthand for saying you were safe. Stuff the aggro people. Bear is like light, keep him shining.